Greetings. You may have heard Pastor Sara speak a few weeks ago about the emergence of our new young adult ministry on Rose Hill, now called Salt House (check it out at salthousechurch.org). I am so excited to feel the continued moving of the Holy Spirit as the ministry begins to take shape under Pastor Sara’s leadership. There is a growing group of millennials meeting and praying and eating and envisioning what God may bring for, through and to Salt House. And a number of you here at Holy Spirit Lutheran have been actively involved helping with the many tasks needed to shepherd the renovation of the property and rest of the work necessary for a successful launch of new worship services early in the new year. Thank you for all you have already done to support this effort. Today I wanted to let you know about a few opportunities to help continue to foster the growth of this ministry, and to ask you to prayerfully consider how you might be called to participate. First, we continue to build a community of people of all ages who feel called to help form a scaffolding of support for Salt House. We need individuals who will attend Salt House worship services and fulfill roles as greeters and helpers – to welcome every new seeker who comes in with a warm smile and hot cup of coffee. We need individuals who will help with meals - hosting, preparing and serving as this new community breaks bread together every week. We need mentors who will help encourage and grow leadership among the young adults finding their way in the new community. And we need your prayers as we take this big step of faith. We also need your financial support. While the new ministry is borrowing capital funds necessary to support the renovation of the building (note that the loan payments will be fully covered by the new ministry with no expectation of any impact to the HSLC budget), there are a number of items that we believe will make a big difference in helping create a warm, welcoming space, including new seating. You may have noticed a Christmas tree in the narthex just to the right as you entered today, with envelopes and ornaments. We are looking to fund new chairs for the sanctuary and the fellowship spaces. 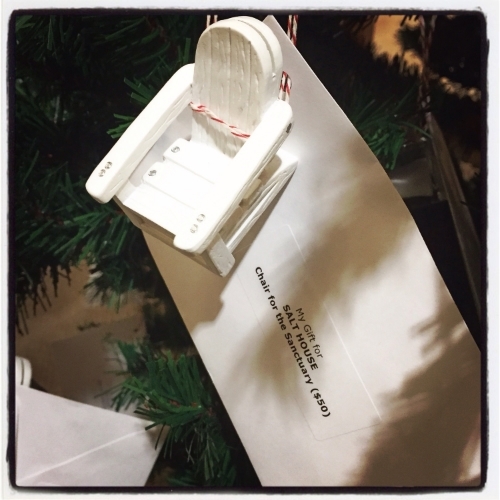 You can take one of a number of chair ornaments from the tree, keep the ornament and place your $50 offering in the envelope. You’ll also find envelopes with small salt shakers for $10, $25, or even $100 to support the purchase of additional worship equipment. There is also the opportunity to make a larger gift dedicated to fully and specifically fund a new keyboard and drumset. Any of your offerings can be left in the locked box in the narthex, or can be put directly in the offering plate today or any Sunday this month. We also have a table at today’s Advent Conspiracy Fair, and you can gift a chair on the Advent Conspiracy form. You can also consider a one-time or ongoing gift to Salt House through our Simply Giving web site. We are so thankful for everything that you have all done already in preparing the way for Salt House. As we begin reaching more actively in the world of millennials, worshiping and sharing God’s call to Come – Thrive – and Go, we wait in anticipation for what will emerge through this new church on Seattle’s Eastside. Jesus is here! Scaffolding for Salt House - Is This You?